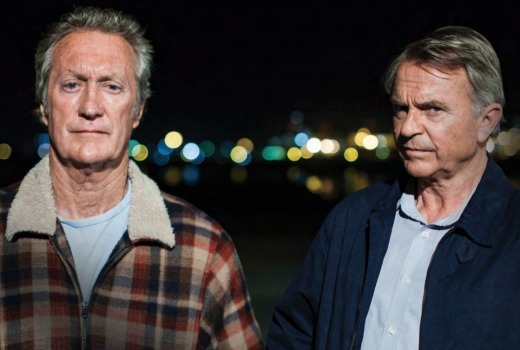 ABC’s stellar year for local drama continues with crime series Old School, starring Bryan Brown and Sam Neill as two crusty opposites working together to solve crimes and scams. It will screen on Friday nights from late May. The series from producer Helen Pankhurst and Tony Ayres of Matchbox Pictures also stars Damian Walshe-Howling, Sarah Pierse, Hanna Mangan Lawrence, Mark Coles Smith, Sacha Horler, Peter Phelps, Kate Box and Steve Rodgers. Director Gregor Jordan (Two Hands) is also an exec producer and a key writer. People used to say growing old was a crime. Lennie and Ted are out to prove them wrong. Ted McCabe (Sam Neill), a retired cop, and Lennie Cahill (Bryan Brown), a retired crim, get together to solve crimes, unravel scams and make some much-needed cash, while avoiding the wrath of the police and the underworld. Sure, their history is muddy – the last time they met, Lennie was part of a gang that pulled off an armed car robbery during which Ted was shot, Lennie was arrested, and the other gang members either died or got away (with the loot). But now that Lennie has been released from jail, and Ted’s been pensioned off, there’s something they both want: to find the remaining members of the gang. Lennie wants his cut of the loot. Ted wants to find out who shot him. And they reckon there’s a likely shot it’s the same bloke. The pursuit of this mastermind binds Lennie and Ted together and they use their collective skills and contacts to solve various other crimes, scams and puzzles. In the course of solving each crime, they fight like cat and dog but always come back together. Working at something makes them feel alive. And they need the cash. Ted and Lennie have both lost their superannuation: Ted’s bank account has been hacked; and Lennie never did get his share of the loot. They’re poor and unable to continue the careers – as detective or safecracker – that used to give them meaning and money. Ted and Lennie are the odd couple of crime solving. One is a tough, honest ex-cop, the other an irreverent ‘honourable’ ex-crim. Ted is steely once he gets the whiff of a case, while Lennie’s a piss-taking larrikin. However they share a certain ‘old school’ code and set of values. And as the series progresses, hanging out with each other will change them in surprising ways. They may approach each case from different directions, creating comic sparks and furious arguments, but they always pull together at the end – just. What is the ending music tune?? I’ve looked everywhere but can’t seem to find any hint as to what it is? Please help! David I hate to break it to you but you described Bryan Brown as a former crime. Not in the article but the descriptive sentence, or whatever it is called, when you click on the article. If I was feeling silly I’d wonder what crime is a Bryan Brown. On the article itself it’s interesting particularly about Sam Neill. He certainly travels around. I hope it is good. Sounds like it might be. It feels like you’ve seen this series already, a stunningly unoriginal idea. But in a soft Friday night slot it will do well with the over 60s plus audience (white, Anglo and aging). Shame the ABC hasn’t a little more ambition and originality and producing shows which reflect a diverse Australia. It increasingly looks like a poor and derivative cousin of the BBC. I mean how great is ABC TV Drama right now, Dr Blake, Janet King, and now this sounds like another cracker. Damien Parer should be great this week also. Any news on whether Janet King is returning ? Looks to be another great show by ABC. Can not wait. This sounds like a very good series, will definitely be watching it, reminds me of the English series New Tricks in a round about way. ABC have some terrific programmes on these days.